Any results for this guy yet? His Big Y results have arrived, and YFull has already analyzed his VCF/BED file. For the moment, he has been placed in the K2b category; but in the next version of YFull's haplotree he should be P*. The P level itself will have to be split (as FTDNA's P tree already illustrates), because he tested positive for P295 and F115 but negative for almost all the rest. Last edited by lgmayka; 04-14-2018 at 11:30 PM. So this guy is practically a basal P*? Will the addition of his kit have much of an impact on the age estimates for P? Last edited by TuaMan; 04-15-2018 at 12:03 AM. Yes, he is essentially a basal P*. Any impact on age estimates will have to wait until FTDNA resumes generation of BAM files. YFull counts 199 best/acceptable unnamed unshared SNPs from his VCF/BED files; the BAM file will presumably add some more (or perhaps move some of his 97 low-quality SNPs to acceptable). 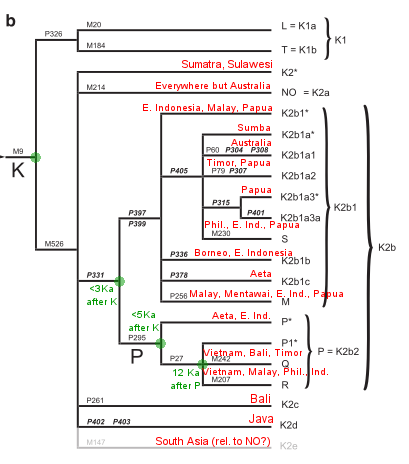 Karafet: "we estimate the total time between the common ancestor of K-M9 and that of P-P295 to be <5 ky, and the time between the common ancestor P-P295 and that of P-P27 to be 12.3 ky ... An alternative explanation would involve an extinction event of ancestral P-P295* chromosomes everywhere in Asia. These scenarios are equally parsimonious. They involve either a migration event (P* chromosomes from Indonesia to mainland Asia) or an extinction event of P-P295* paragroup in Eurasia. 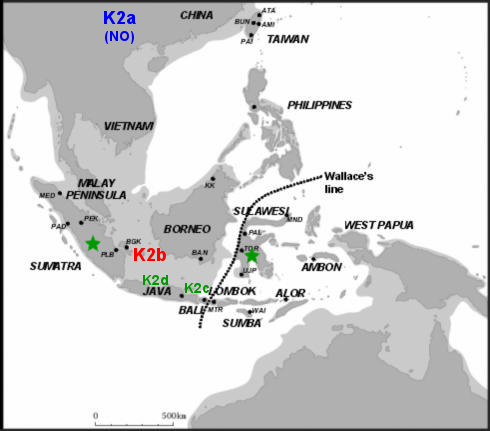 However, given the geographic distribution of the P331 mutation, the immediate predecessor of P lineage and its likely origin in Southeast Asia/Indonesia, the existing evidence favors the first scenario." So assuming he is P27-, the split from the rest of R, Q, P27 would be about 40000years back? P295xP27 is in Timor and the north Philippines. So on both side of Wallace's line. BAM File sent to lgmayka and loaded......don't know how long it will take...that file is HUGE!!! YFull has stated that hundreds of such BAM files have been submitted since FTDNA resumed generation. I suspect that the backlog will take some time to clear. Since they only get paid once they complete analysis their motivation should be strong. I can't wait to pay them myself for my new submission. I noticed that the sample in K2b at YFULL is no longer italicized but they haven't moved it further down the tree than K2b. Have you attempted to manually verify any of the P SNPs? Of course there's lots of them so it's a long and drawn out task but just curious if anything is happening to see where this fellow's line truely split off from mine.